Just a couple of hours after I posted my Day 1 entry, I was out o the house again to go to the airport. My flight was at 6am, which meant that the latest I have to be at the airport is 5am. Just to be on the safe side, I figured I should be there by 4:30 am. I left my brother’s flat about 10 minutes before 4am. Instead of calling for a taxi, my brother said it would be much cheaper just to flag a cab from the street. Since there’s virtually no traffic, it’s okay to flag a cab from the side of the road, and not just on designated stops. Luckily, an empty cab was just arriving as we crossed the street. 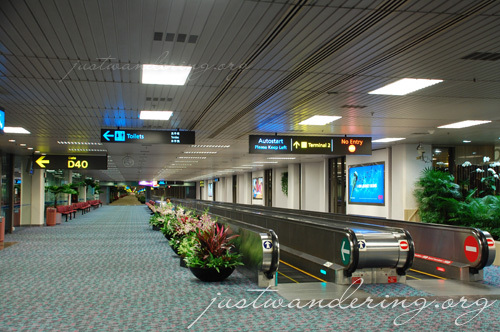 The drive to Changi airport was very fast and in just 20 minutes, I was inside Terminal 1. The fare comes to about SG$14 or so. Since it was late (or early), there’s a surcharge you have to pay on top of the fare. The total comes to about SG$17.20. When I got to the check-in counter, it was just opening. Check-in was fairly fast, and as soon as I cleared immigration, I head to the free Internet kiosk. There was really nothing much to keep you entertained this time of the day, and there’s hardly anybody inside the terminal that there’s plenty of Internet stations for those who want to use. The flight is at 6am, and normally, the boarding commence at least 40 minutes before. Though the boarding was late, we were still able to leave just a couple of minutes late. I wasn’t able to get much sleep, so I spent most of the flight sleeping (which I hardly do). We hit some turbulence, but it wasn’t as bad as the ones on the flight from Manila to Singapore. Two hours later, the captain was announcing that we are approaching Siem Reap. As tired as I was from my lack of sleep and uncomfortable napping position, I couldn’t contain my excitement about finally being in Cambodia. I have been planning on visiting the country ince 2006, going so far as to buying a ticket from KL to Siem Reap for January 2007. However, my Australia trip changed all that, and it’s only now that I had the opportunity to push through with my plans. 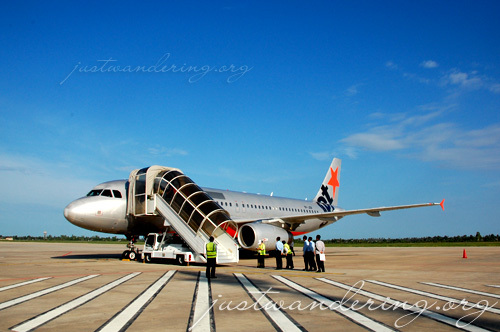 I exit the aircraft and I was welcomed by the site of the beauiful Siem Reap International Airport. 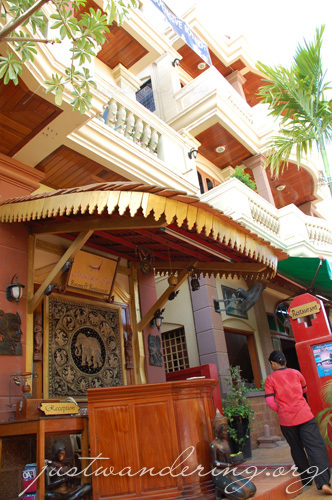 Built in traditional Khmer style, it’s definitely a welcoming sight to all weary travelers. 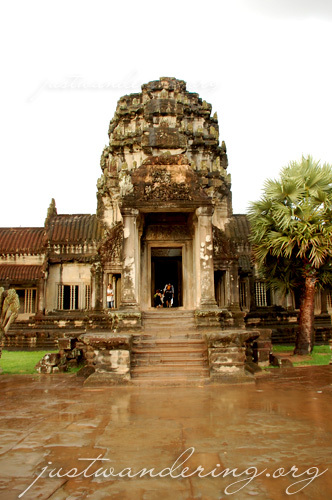 Because of the Angkor Wat, Siem Reap sees millions of tourists every year. With the recent A(H1N1) pandemic, they are very proactive in trying to prevent it from entering the country. Aside from the immigration and customs forms, we also had to fill out a form regarding where we have been from the past 7 days, and whether we had the sympthoms of the influenza. There’s also a thermal scanner just before you go into passport control. Visa application forms are given onboard the plane, but you’d need 2 passport sized photos for them. However, if you’re holding a Philippine passport or a passport from the member countries of the ASEAN, you wouldn’t need to apply for a visa — you’ll be given a 21-day pass upon entry. I like to book my accommodation ahead when traveling, and since they’re offering free airport pick-ups, I availed of this service from Mandalay Inn, where I’m currently staying. My driver was waiting with my name on a placard when I came out of the airport, as promised. It was a lovely drive from the airport to downtown Siem Reap. I enjoyed looking at the interesting architecture of the buildings that line the street. I’m seeing the names and logos of establishments that I’ve read about online, even signs for the infamous happy herb pizzas (which I’m staying clear off). We turned down a road there stood Mandalay Inn. Check in was a breeze, except when the receptionist billeted me to the $15 per night room, when I reserved for the lowly $7 fan room. I had doubts about my fan room when I entered. The sun was high up in the sky and I’m feeling the heat. Opening the window help, as did turning on the exhaust in the bathroom. Now that the sun’s down, the temperature is just right. I spent the morning sleeping, and went down for a late lunch around 1pm. Mandalay Inn advertises free Wi-fi in the rooms, and though my laptop can detect the guesthouse’s router (they have more than 4), it would disappear as soon as I try to connect. The signal was pretty good at the restaurant though, and I spent the afternoon catching up on e-mail, RSS, Facebook and Plurk. The sun has been shining brightly the whole afternoon, when suddenly the clouds came in and theatened to pour rain at any minute. I took that as a sign to log off and get ready for my 4pm pick up. I made some inquiry and booked my tuktuk driver and a guide for the Angkor Temples even before I left Manila. Kim Soryar is recommended everywhere online, and I decided to just book with him. 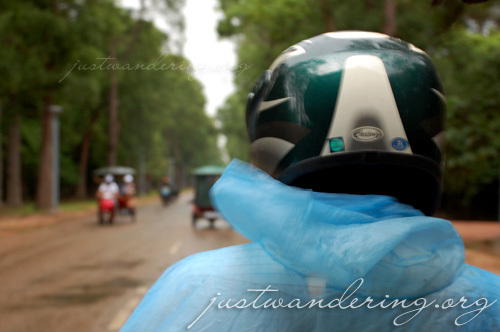 I hired a tuktuk and driver for two days and a guide for one day. I wanted to take a sunset shot, and told Soryar this. Clearly, he knows where the best spot for watching the sunset is, and we agreed that the driver will pick me up at 4pm. On the dot, Prem, my driver arrived at the Inn. We set off for the Temple to buy my temple pass for the following day and to view the sunset. The drive to the temple was even more plesant as the drive from the airport. 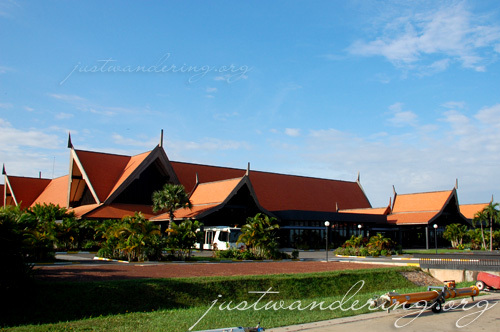 The high end hotels line the road leading to Angkor and the buildings are gorgeous. The roads become lined with trees as soon as you enter the temple grounds, and it’s really quite a relaxing sight. We reach the ticket offices rather early — tickets for the following day is only available for sale starting at 4:45pm. As I waited with the other tourists, the rain poured in earnest. Interestingly, it only lasted as long as the wait for the ticket booths to open. As soon as they started issuing tickets, the rain let up, leaving just a slight drizzle. There are three types of Angkor ticket: one-day, three-day and one week. They cost $20, $40 and $60 respectively. The ticket has your photo on it and the date of validity. You’re not supposed to tear it, fold it, wet it or tamper with it in anyway; doing so invalidates it and you’d need to buy a new ticket. The temple complex opens at 5:30am and closes at 5:30pm. Entrance is free starting 5pm, but you’d still need a valid pass for the following day before they’d allow you to enter. 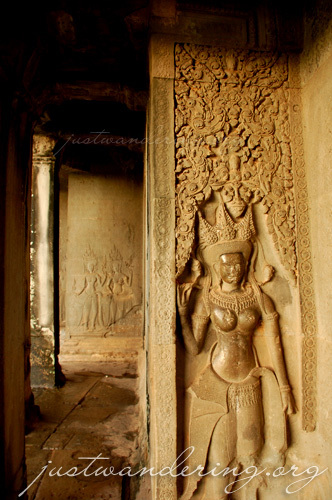 The ticket allows you access to all the Angkor temples, except for Kulen and Bengmelea. A vehicle is really needed when visiting the temple. Even if you’re just visiting the Angkor Wat, it’s a looooong drive from the entrance to the actual temple. You can rent a bike and bike in the complex, but you need to have a lot of stamina for this. Another great thing about hiring a driver is that they already know where the best places are. Prem took me to the foot of the mountain where he said is the best spot for it. Unfortunately, rain + mountain + hiking don’t mix well in my book, so I asked him to take me to the Angkor Wat instead. To be honest, I once questioned my desire to see Angkor Wat. Is it something that I really wanted to see or because it’s something that I feel I should visit because everybody’s going there? Any doubts were wiped off my mind as I walk the bridge towards the temple. It was still drizzling and the path was wet and some parts were muddy. There must really be something about the Angkor Wat that I didn’t mind that my feet were wet, and so is the hem of my pants. I can’t stop taking photos of the structure. Everything was simply gorgeous. I’m starting to understand why people return to this UNESCO World Heritage site over and over again. It was still fairly early, so I asked Prem to drive me around town just so I can get acquainted with the place. Instead of dropping me off at the Inn, I asked him to drop me off at the Angkor Night Market, that I saw on the way. The market advertises that they’re open starting at 4pm, but at 6pm, most of the stalls were still closed. It was mostly a tiangge (bazaar), with stalls selling pretty much the same thing. But there are interesting stuff as well, like the Dr. Fish foot massage and the movie place that shows a documentary about Cambodia’s Pol Pot. After a quick round of the market, I head back into the main street and start my way back to Mandalay Inn. I pass a convenience store, and went inside to buy some snacks and bread for breakfast tomorrow morning (Prem and my guide are picking me up at 7am). So far, my transactions were all in dollars. All the prices are in dollars, although when the cashier gave me my change, it was in Riel, Cambodia’s local currency. Similarly, when I asked for the price of a bottled water at the Vietnamese Pho stall I ate at, the price the guy gave me was in Riel, though the bowl of pho was quoted in US dollar. This is messing up my accounting! Sooo… here I am in Siem Reap. It’s 11:30pm, and I’ve been writing this entry for over an hour. I have to sleep before a full day at Angkor, and here’s to hoping I get some shut eye before 7am! Feel na feel ko na ang adventure mode, Nina! Mandalay Inn looks quaint and cozy (we have that same cloth/bas-relief elephant wall hanging at home). And Angkor Wat looks amazing. Sayang lang basa ang daan, but I read that it often rains there. Did you get the one-day pass or the three-day one? Why do they have the scaffolding set up at Angkor Wat? Beautiful photos and an inspiring write-up! Seven dollars a night for a decent hotel… or fifteen bucks with a/c? Really? I mean… seriously? I hope you post some photos of your room, please! This is a real adventure already… and you’re just starting out! 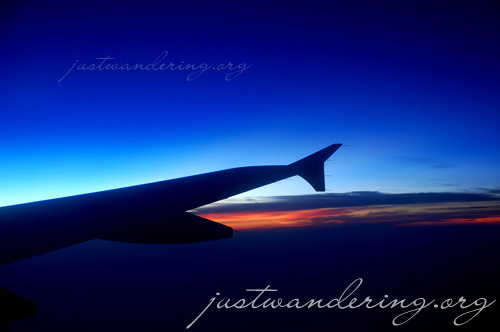 I’ll be checking back every day to keep up with your travels! Ooo Siem Reap! 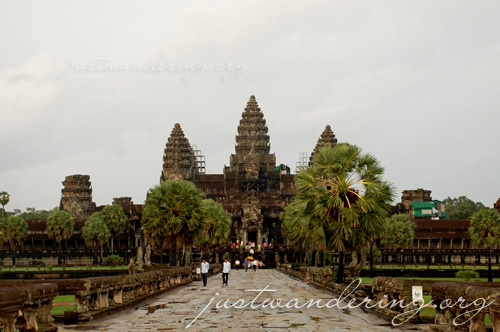 I can’t believe that even for a moment, you contemplated not going to Angkor Wat.. Sounds like hotel prices haven’t changed much since I was there a couple of years ago. Looking forward to your Siem Reap entries. Don’t forget to try the local baguette with minced meat ! 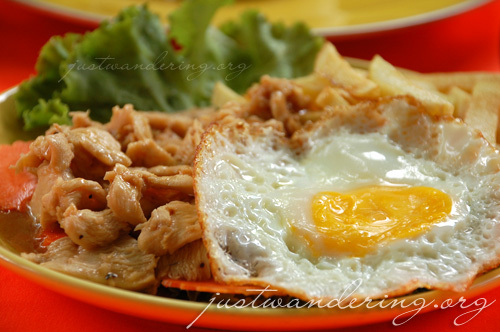 (at least that’s what I remember it was) And oh.. fried grasshoppers.. Yummy. And the free classical concert at the children’s hospital. A lot of things to do really in Siem Reap. Thinking of going back! Davidd: There are photos of my room in my flickr. It’s supposed to get its own entry, but I’ll see if I will have the energy to write it later on. Can i ask you how much Kim Soryar rate was for a one day guided tour? PS I envy your life can I borrow it even for just a month or two? I enjoyed reading your post. I’ve been dying for years to viisit Siem Reap (Angkor Wat). Now, was able to recruit my sis and a friend and we plan to go on Jan 11, 2010. If we can book on cheap fares. we plan to go to bangkok from manila on the 11th. then on the 12th bangkok -siem reap, then leave on the 14th for bangkok then back to manila on the 15th. Do you think this sched is ok? or do you have any suggestions? I don’t know what plane to take yet , even hotels. I wonder how much Kim Soryar will charge us for his Tuktuk and guide services. Do we pay for his entrance inside the Temple (Angkor Wat) premises? Pls help us. Thanks. Hi Nina! 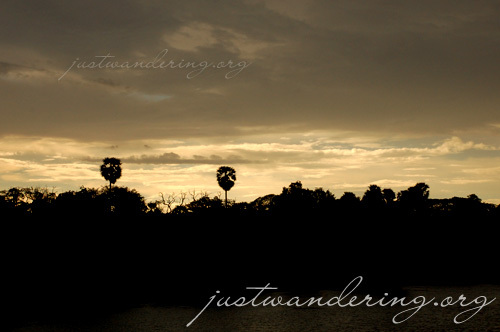 i happened to come across your site when I was googling to find out about Cambodia. I am going there for a short trip in July, I was wondering if I could find out more about Kim Soryar from you? How much he charges and how I could contact him? I will only be going for 2 days so I need to really maximise my time and booking ahead would really help! P.S: I envy your traveling! Hopefully I will get the chance to travel soon! I stayed at Mandalay Inn as recommended. Great .. Nothing can complaint..walking distance to old market, wifi, Gym, restaurant, tour agent… I do recommend. Your Siem Reap entries have been helpful in organizing our family’s trip to Cambodia last December. If you don’t mind, I’m putting a link of your website in my blog so I can acknowledge you there.